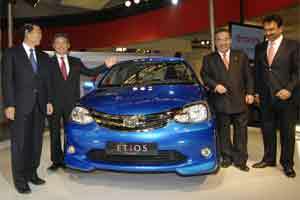 New Delhi: Japanese car maker Toyota is recalling 41,000 units of its sedan Etios and small car Liva in India to replace faulty inlet pipe to fuel tank. The company, which is present in India through a joint venture with the Kirloskar Group - Toyota Kirloskar Motor (TKM), however, insisted it is not a recall but a “safety campaign". He said a total 41,000 units of Etios and Liva produced till 8 October this year since their launches will be covered under this exercise. “It will not take more than 30-45 minutes. This is not recall, it is a safety campaign," Singh insisted. TKM had in December last year launched the Etios sedan in the country priced between ₹ 4.96 lakh and ₹ 6.86 lakh (ex- showroom Delhi). In June this year, the company rolled out its much anticipated small car Liva here, priced between ₹ 3.99 lakh and ₹ 5.99 lakh (ex- showroom, Delhi). Singh said TKM is using social media such as Facebook and the company’s own website to inform customers about the development. The auto major has also invested ₹ 3,200 crore to set up its second manufacturing facility in Bangalore, where the cars are being produced. The company is investing ₹ 1,650 crore to ramp up its production capacity by one lakh units and for increasing localisation of components by 2014. In October this year, the company had also revealed its plans to start exports of the two models to South Africa by March next year. Besides, Etios and Liva, Toyota also sells premium sedan Corolla Altis and Camry in the Indian market along with SUVs Fortunner and Prado.